Does this sound familiar? You want to enjoy your favourite TV show while your partner is watching a sports game with his mates and the kids are begging to see their cartoons…Or maybe you are expecting your extended family to move in for the unforeseeable future. Wouldn’t it be great if they can all watch what they like? Here’s when our professional technicians can offer their help. They can run a separate TV point to each room of your home, so every family member can access a desired program. They don’t need to fight over a remote control anymore! Most newly built homes will only come with a couple of TV points. Quite often they are not in the position where you want your TV installed. Running cables across the room is an option, but not practical and certainly not the best look for a new home. When our technician runs an extra TV point for you it will look like it has always been there. He will install proper fittings and ensure all cables are run in the wall cavity where possible. How many storeys are in your house and which storey is the TV point being installed on? Is it a brick veneer, double brick house or any other type? Will the new point be on an external or internal wall? External walls run around the perimeter of your house and usually have a cavity all the way through. While the internal wall’s cavity is usually blocked by studs. 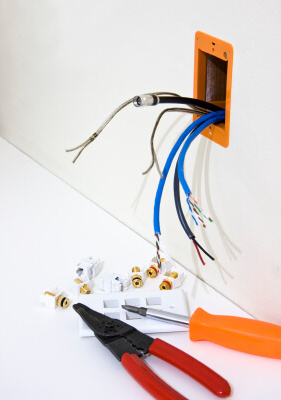 It is generally easier to run cables inside the external wall. What type of roof you have and is there an access underneath your house? Based on your answers to the above we will be able to give a quote over the phone or send a technician to assess the job onsite.